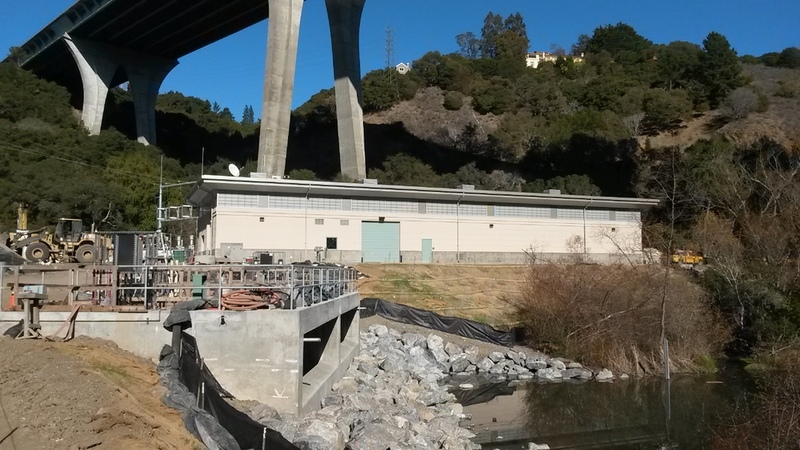 The new Crystal Springs Pump Station with energy dissipation structure and San Mateo Creek in the foreground and Highway 280 overpass above. The new pump station replaced an existing facility. The Crystal Springs/San Andreas Transmission System is composed of a series of reservoir outlet structures, pump station, and pipeline that moves water from the Crystal Springs Reservoirs north to the San Andreas Reservoir and the Harry Tracy Water Treatment Plant, before placing water into the distribution system. This WSIP project involves substantial improvements to the water transmission pipeline, upgrades to four of the outlet structures at Crystal Springs and San Andreas reservoirs and the Upper Crystal Springs Dam culverts, and the construction of a new Crystal Springs Pump Station. ECS provides several Construction Management services on this large-scale, multi-facility project, including project controls, scheduling, tracking, reporting, change order review and negotiation, dispute resolution, field office engineering, inspection, quality assurance, and claims avoidance. Facing many challenges, the Construction Management team has worked with the SFPUC to mitigate risks, control cost, and manage a highly intricate schedule. Completion of these system upgrades will ensure that the San Francisco Peninsula’s emergency and supplemental water supply can promptly be conveyed into the system. New yard piping for the Crystal Springs Pump Station. The facility draws in water from the Lower Crystal Springs Reservoir and pumps it to the San Andreas Reservoir for use at the Harry Tracy Water Treatment Plant. Placement of a specially fabricated expansion joint hinge. The section is installed along with the new reinforced concrete liner of the San Andreas Outlet Structure #2 tower. In the foreground, access for upgrades inside the Crystal Springs Outlet Structure #1 tower. In the background, a subcontractor’s floating barge performs work in the Lower Crystal Springs Reservoir.